Who doesn’t love the taste of a glass of Bailey’s Irish cream during the holidays? It is rich and thick and so creamy with that delicious hint of whiskey in the background. Now imagine that taste in a piece of holiday fudge! BOOM! What a flavor combo! Making fudge is a favorite of mine pastime during the holidays. I don’t make fudge very often during the year, because I do try to watch my weight, but during November and December I indulge in it. This recipe for Irish Cream Fudge infused with Bailey’s Irish Cream & cold Coffee is as tasty as can be. It is my favorite sweet treat, so I like to have a lot of fudge recipes on hand. NOTE: This is not a really easy fudge. 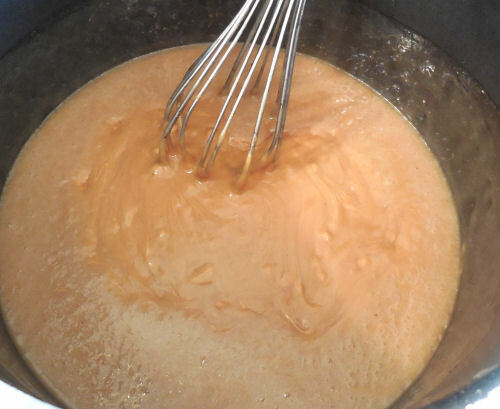 In order to get the right consistency, the main fudge mixture must be boiled for five minutes or so to get it to the soft ball stage. But the flavor makes it worth the effort. 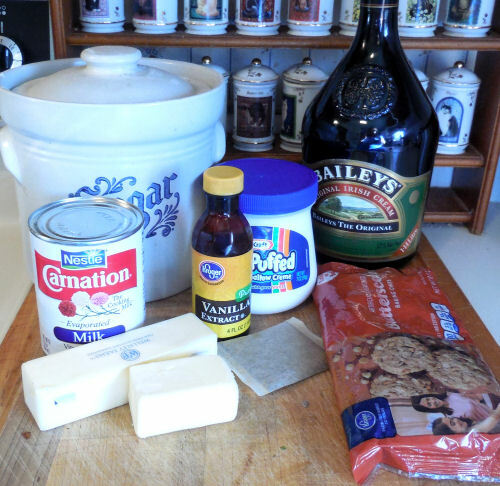 To make the Irish Cream Fudge, you will need Bailey’s Irish Cream. I had a bottle on hand that was unopened, but when I undid the top, I discovered to my horror that it had gone off and I could not shake it to make it good again. Since I had all my ingredients out and it was a Sunday, I decided to make my own Bailey’s Irish Cream. It is just as good as the original and costs a fraction of the price. 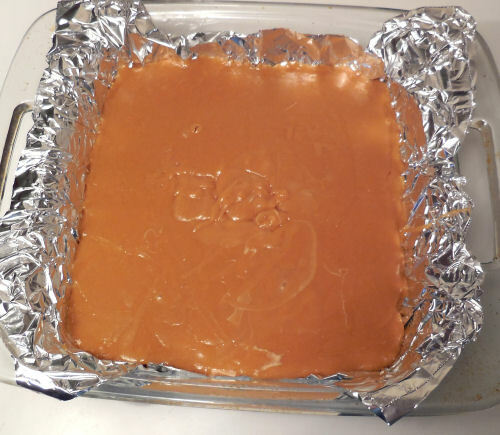 To make this Bailey’s fudge recipe, start by placing aluminum foil in the bottom and up the sides of a 9 inch pan. It will make it so much easier to get the fudge out later. Just use the pieces on the top as handles and then peel it off later. Mix together the Bailey’s and cold coffee and place it in a microwave safe bowl and heat for about 20 seconds until it is well mixed. 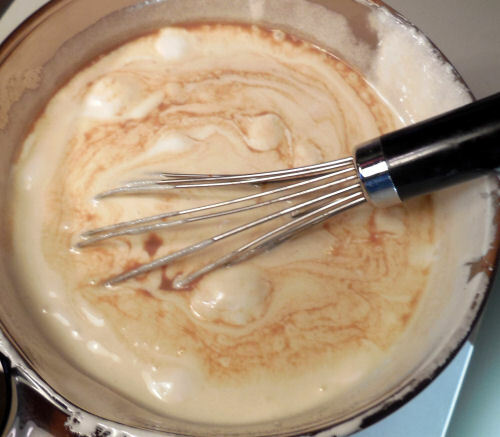 On the stove top, combine the butter, evaporated milk, sugar and marshmallow cream until well mixed and smooth. Slowly stir in the Bailey’s Irish cream mixture and mix well. Continue to cook after it boils for five minutes, stirring the whole time, so that it does not stick. It will be at the soft ball stage. (drop a bit of the fudge mixture into a glass of water…it will form a small ball.) Stir in the butterscotch chips and vanilla extract. 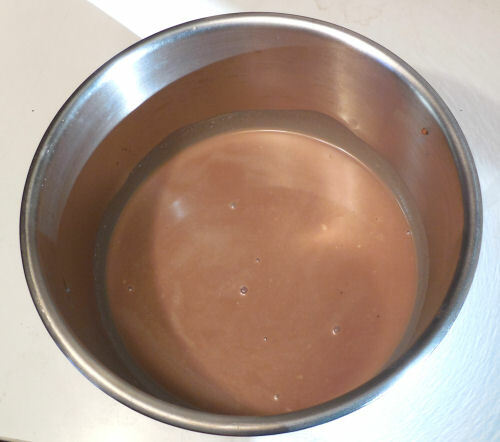 Pour the mixture for the Bailey’s fudge recipe into your prepared pan. I had to hurry as it was starting to harden. I love this stage. I know that I have cooked it long enough when it starts to harden on the sides of my cooking pan. There is nothing as discouraging as spending time on fudge and not having it set later. 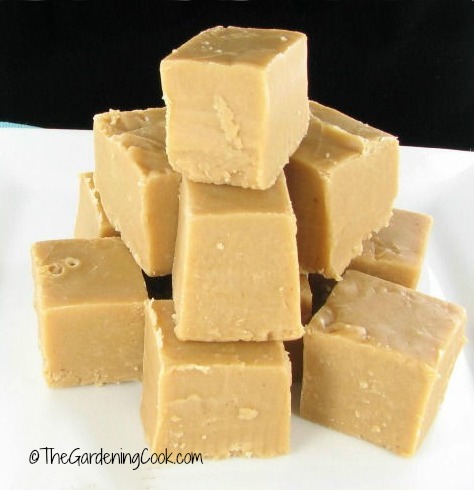 This Irish cream fudge has the perfect texture. I like a fudge that is not too sticky and this one cuts into beautiful chunks. The taste is sweet and creamy with a hint of coffee in the background. My husband is a big coffee drinker and really likes this fudge! Place in the fridge until set. Cut into pieces and enjoy. For more great Bailey’s desserts, try these Baileys Mudslide Truffles, and Bailey’s Irish cream brownies. YUM! 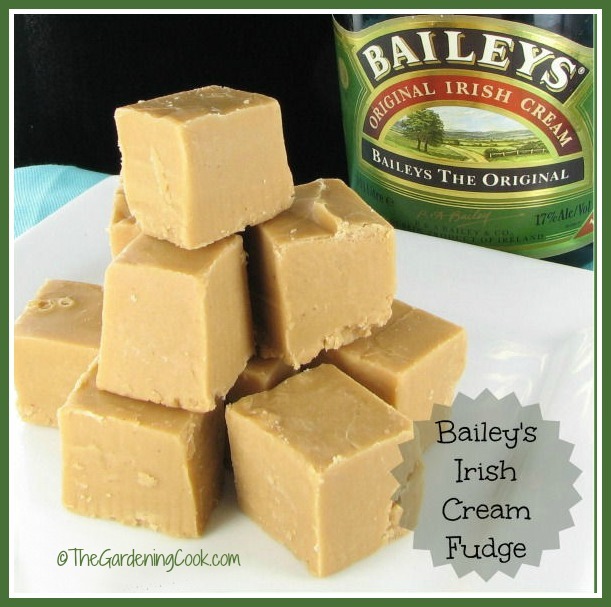 Would you like a reminder of this recipe for Bailey’s Irish cream fudge? Just pin this image to one of your Pinterest dessert Boards. Get the taste of Bailey's Irish cream in a piece of holiday fudge, for the ultimate in Christmas sweet treats. In a small bowl combine Bailey's Irish cream and the cold coffee. 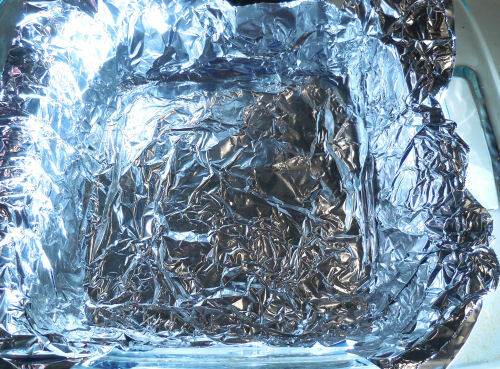 Place the mixture in a microwave safe bowl and heat on high for 10 seconds. or until melted and dissolved well. 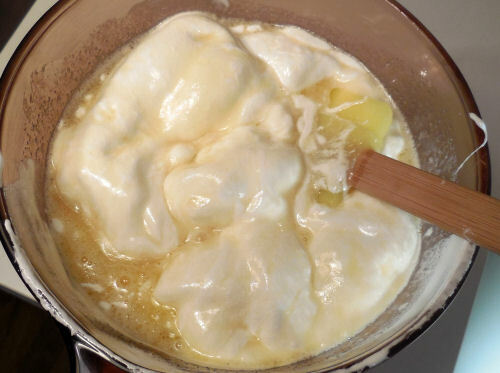 Melt the butter milk, sugar and marshmallow cream in a saucepan on the stove over medium heat. I wondered the same thing. I’ve made several fudge recipes with marshmallow cream and always put it in at the end, after the boiling stage. I followed this recipe exactly and it never set, in fact was still quite liquidy pouring into the pan. Guess I’ll try again adding the marshmallow cream after boiling. Tasted good but wasn’t presentable. For those having issues getting the right consistency… With trial and error I have learned that your butter, sugar and evaporated milk must boil to exactly 238° which is soft ball stage before anything else is added. As soon as it reaches 238° turn off and remove from heat. Then add your other ingredients and mix until smooth. First thing I would tell inexperienced candy makers is you CAN NOT make candy if it raining. I know people say I’m crazy but I have found it true. This might be a dumb question but I want to make sure I make this right. The recipe calls for cold coffee. That is in liquid form not coffee granules right? Thank you so much for sharing this recipe! As an inexperienced fudge maker the “soft ball” information was very helpful. This is the best fudge I’ve ever tasted! I make fudge every year usually 4-5 different types. I questioned the amount of sugar to my other recipes that use marshmallow cream. Your is 1 cup more. But the reviews seemed ok. Well mine turned sugary. It’s not humid, accurate candy thermometer and I’m a candy maker. So suggestions why mine flopped? Son in laws birthday is Saturday and he loves fudge and Irish cream. ??? Many recipes use sweetened condensed milk. I chose to use evaporated milk instead, so felt the fudge needed the extra sugar. I have to redo the photos in the recipe to be more up to date. I’ll try the recipe with less sugar to see how it turns out.